Just one week left to purchase admission to our “Cheers to 10 Years” event on Saturday, 4/21. Ticket sales close Thursday, 4/19, so don’t be shut out of this fun-filled adults-only evening. Check out the Auction website to see detailed info regarding tickets, raffles, live auction packages, student art, teacher experiences, and parent-hosted parties. This year’s theme celebrates the massive hard work of our Bonny Slope parents, both past and present. Together we have built a thriving school community through BSCO’s creative programs, family events, and extensive teacher support. In the spirit of our first decade, HERE'S A LOOK AT TEN THINGS that your BSCO donation provides to our students, all organized and staffed by BSE volunteers. BSCO provides an incredible amount of teacher support, which includes $450 per classroom teacher & specialist to bulk up their classroom with books and materials. Examples include books for the classroom library, storage items such as bins and shelves, any needed office supplies, flashcards & games, & decorative posters. In addition to classroom support, BSCO's Staff Appreciation committee oversees the potluck meals, "Stock the Pantry," and Staff Appreciation week efforts for our entire Bonny Slope staff. kindergarteners enjoy their classroom light table, purchased through bsco's teacher grant program in 2015. Another option for teachers is BSCO's Teacher Grant Program, including many of our mature grant traditions, such as the THPRD Nature Mobile for kindergarten, the sweet little chicks for first grade, and fifth grade’s Newbery Book Club. Other previous grants include a classroom aquaponics system, kindergarten light tables, stream table kits, HOKKI stools, and mathracks. BSCO provides science enrichment and PYP support supplies for every classroom. These classroom PYP materials are directly related to the Units of Inquiry. Items purchased in the past include ant farms, microscopes, flashlights, magnets, classroom books, and owl pellets. BSCO also provides $500 per grade per year for grade-level field trips. In recent years, BSCO has helped with facility improvements, most notably the playground sun shade, the wall-mounted projector in the gym, and this year's replacement of all classroom projectors. The wall-mounted gym projector was funded by BSCO in 2016. All art enrichment is funded through BSCO, including Art Lit supplies for every student for six Art Lit projects annually, as well as an annual Artist in Residence project or installation. Examples of past AIR projects can be found throughout the school, including the tile mosaic at the front entrance, the photography in the library, and the cyanotype U.S. map. 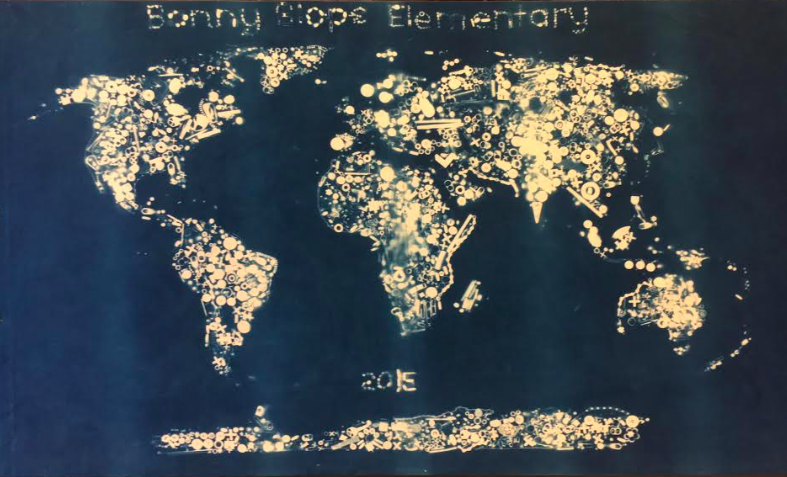 The world map in the hallway was created through 2015's Artist in residence program. Students enjoy the recent Science Night. Science events such as STEM in Residence and Science Night, are offered to every single student at BSE. This year's Science Night had over 400 in attendance with 135 student scientists. Family events, including the August Playground Playdates, the Back to School Picnic, Monster Mash, and Carnival, were all offered with free admission thanks to your past generous BSCO donations. 2017's Carnival had over 1500 BSE community members in attendance (a new record), while last fall's Monster Mash cast its spell on over 670 Bonny Slope children. Three Parent Education evenings, each with an expert presentation on relevant parenting topics, are funded courtesy of BSCO. Past presenters have covered technology and the youth brain, anxiety, anger, entitlement, connected communication, and executive function in the pre-teen brain. BSCO provides all materials for year-long Student Enrichment programs, such as Geo Club, OBOB, & Bobcat Trail Club. Over 400 of BSE students participate in Bobcat Trail, running over 6000 miles total in this school year alone. Geo Club had over 1/3 of the student population participate last year and BSE's Obob team won the state title in 2017. BSE welcomed visiting author, Nick Bruel, last fall. Fun-filled school day events, such as Visiting Author, Cultural Enrichment assemblies, and Field Day are all brought to you by BSCO. This year's Indian Culture events was a joint effort between the Cultural committee and Art Lit committee, both powered by BSCO dollars and by BSE volunteers. BSCO’s budget details can be found online. Any questions regarding the depth and scope of BSCO’s programs and events can be directed to Ashish Gupta (president@bonnyslopebsco.org).